Bill is the sushi rice maker in our house. I don't even do it any more - it's his job. The basic ratio of rice to water is 1:1, and his cooking time is 10 minutes of cooking followed by 10 minutes of steaming. But I'm jumping ahead of things. First of all, it seems obvious, but if you're going to make sushi, buy sushi rice. You can get it in many grocery stores or health food stores. Sushi rice is a short grain rice, so if you must substitute, you want something short-grain. You will also need rice wine vinegar, sugar, mirin, and salt. 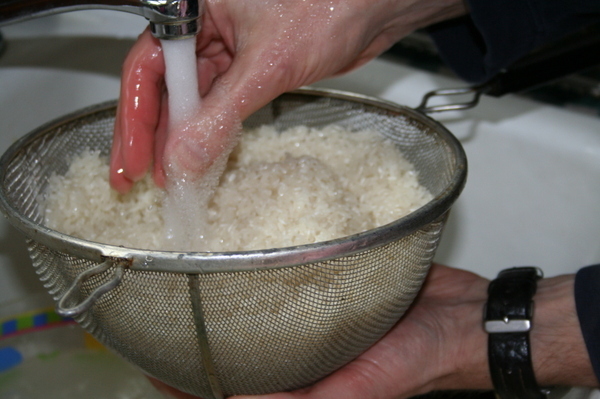 First thing you'll need to do is rinse the rice in cold water. Bill does this in a strainer, under running water. What you're doing here is washing the starch off of the grains of rice. Starch is great if you're making risotto, and you want that creamy texture, but when you're making sushi, you want each grain to be distinct and separate from the other grains. So keep rinsing. Get your fingers in there and work the grains of rice under the water. You want the water to run clear. 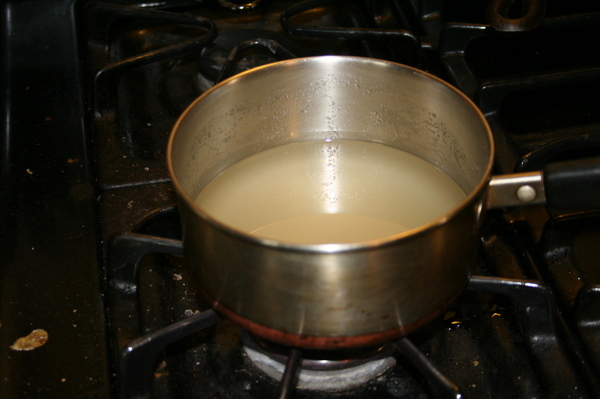 Once that's all set, place the rice in a pot with an equal amount of water (by volume - i.e. 1 cup to 1 cup). Bring to a boil and cook for ten minutes, then shut the heat off and leave the lid on and let it sit for another ten minutes. DON'T OPEN THE LID. You'll let the steam out too soon and the rice won't cook properly. When the rice is cooked, fluff it up a bit with a fork to separate the grains. Taste it - you want it firm, but not al dente. It should be cooked all the way through. While the rice is cooking and steaming, you need to make the vinegar mixture. There are different recipes for the vinegar mixture, but the preparation is the same. The ratio Bill has been using for some time now comes from a book he bought me way back when, called Sushi Making at Home, by Yasuko Kamimura. It's a fun book with lots of step-by-step photos on how to make sushi rice, how to make various kinds of maki rolls and all sorts of other related dishes. Heat these together to dissolve the sugar and the salt. (The above proportions are for a 3 cup batch of rice - 3 cups before cooking). 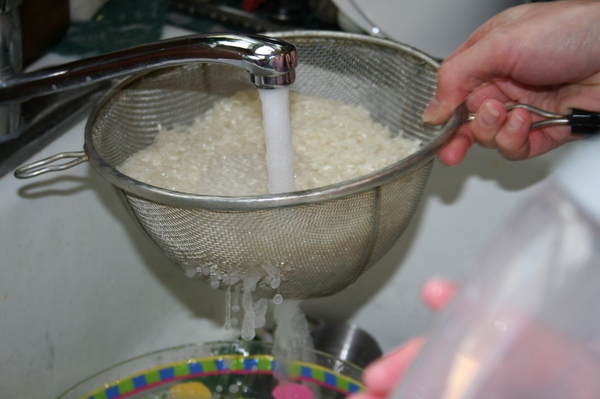 Put the cooked rice in a large bowl and pour the vinegar mixture over the rice. 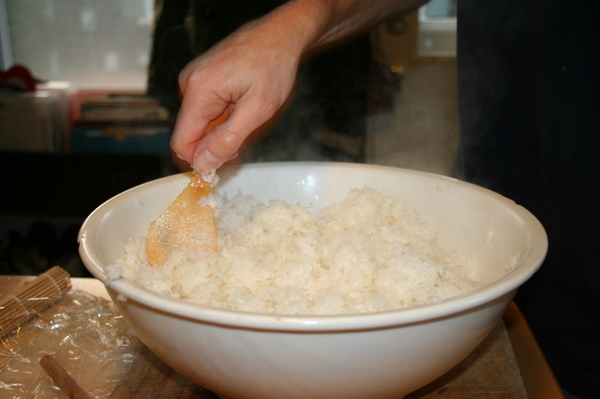 With a paddle or wooden spoon, you want to mix the rice with the vinegar using a cutting motion. At the same time, you're also slowly cooling the rice. The book also says to fan the rice with one hand while you're mixing the vinegar in with the other hand. Sort of a culinary version of patting your head and rubbing your stomach. Anyway, once it's mixed well and cooled, cover with plastic or a damp cloth so the rice doesn't dry out. Bill also mentioned just now that he makes more of the vinegar mixture than called for, to rehydrate the rice if needed. * And another useful tip - keep a bowl of water mixed with a little rice vinegar handy - the sticky rice will adhere to your hands after you work with it for a bit, and rinsing your hands often in the vinegar water will help counteract that. All set? Okay, now you can go make a Soft Shell Crab Roll.